There are some Formula One Grand Prix events that have the happy knack of establishing themselves from the word "go". The event at the Autodromo Dino Ferrari at Imola is one such, another is the Austrian Grand Prix on the majestic Osterreichring. Others like the Belgian Grand Prix at Nivelles, the Spanish Grand Prix at Jarama, the French Grand Prix at Dijon all seem the fall flat on their faces from the start. I think "ambience" is the only word to explain it. Certain entrepreneurs may think the public are gullible, but in the long run this is not so the spectator goes to a Grand Prix to see what is going on and to be part of the scene, and at Imola this is encouraged. The circuit runs up and down the foothills on the very edge of the town and there are some superb viewing points for the general public, the uphill Tosa hairpin at the end of the long fast curving section after the pits is a case in point. It is here that some audacious overtaking is done, like Piquet taking the lead from Senna on the opening lap of this year's race and the two McLarens of Prost and Rosberg relegating the Lotus to fourth place on lap four. I would not like to estimate the number of spectators on the hillside overlooking Tosa, but if it had been a Ferrari taking the lead "Uncle Enzo" would have heard the cheering in Maranello. The Italians go to Imola (or Monza) because they love motor racing and always have, but above all they go to see Ferrari cars win. This year their mission was hopeless and the attendance suffered, given no support by the weather gods either, for it was grey and gloomy and rain threatened. Although a few spots of rain fell as the cars prepared to assemble on the grid they came to nought and we were very lucky to have a dry race, but an hour or two after it was over the rain began and continued to fall for the next 15 hours! 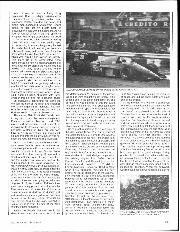 The crowd on race day was something like 80,000. a mere shadow compared to years when Ferrari has been on top, but at the moment the Ferrari team is suffering, not for any specific reason, but mainly because the opposition is immensely strong. When the opposition is weak Ferrari steam-roller their way into the ascendant, but with Honda, Renault and Porsche, aided by Williams, Lotus and McLaren with Piquet, Mansell, Senna, Prost and Rosberg to help them it is not surprising that Maranello cannot cope. The Ferraris were fast, as shown by the Longines-Olivettis speed-trap before Tosa, they were topping 200 mph in qualifying, and Alboreto was trying really hard all the time. His team-mate Stefan Johansson was smiling bravely and saying he was fit, following his head-on crash in Spain two weeks before, but he was not 100%, and to keep up with the opposition he needs to be 110% fit. His crash in Spain was due to a mechanical error in the braking system caused by bad workmanship, so it was not surprising that he was reluctant to have blind faith in the brakes and by not "hammering" the brakes the carbon-fibre discs and pads did not reach their correct working temperature and this affected expansion rates which in turn aggravated working clearances and gave a feeling of instability to the brakes. Johansson was on the downward spiral of confidence and drove slower and slower, convinced that his brakes were failing again. Alboreto's race faded away as the power from his engine disappeared due to loss of boost pressure from the turbochargers. At one time turbocharger failure could be seen a mile away by the cloud of smoke from the exhaust pipe. The weak point in the turbochargers was the centre sleeve bearing supporting the shaft carrying the exhaust driven turbine on one end and the compressor impeller on the other end. This floating sleeve bearing is lubricated at something like 80 psi so if the bearing failed, oil at high pressure either went into the compressor and right through the intake system, or straight into the red-hot turbine and the exhaust system, with the inevitable smoke and flame. Bearing failures have very nearly been eradicated by development work, but now a new trouble has appeared. With the present fuel limitation of 195 litres for the race, mixtures are being run leaner and leaner and everything is running hotter and hotter and now the tips of the turbine blades are burning away, which means the turbine does not spin like it should, the compressor slows down and the boost-pressure falls away and the power drops with no dramatic outward signs. This is what happened to Alboreto's Ferrari in the closing stages of the race. The restricting of fuel to 195 litres for the race has turned Grand Prix racing as it is meant to be, into an economy run. The real Grand Prix driving is seen during the hour of qualifying on top two afternoons of practice. On a fast circuit such as Imola where engines can really work hard, and in consequence use more fuel, race day has become a farce, though it is not always obvious. In the opening laps it looked as if Piquet was running away from the rest of the field, but in fact they were restraining their natural urge, for their instrument panel figures were telling them what their consumption rate was, and so was Piquet's, except that his indicators were giving him bad news, which is why he eased up dramatically after 15 laps. Like most of the top teams he is in touch with his pit staff by means of radio and they tell him what his instrument figures should be: if they are not in agreement he tells them and eases back on the power until he gets the correct reading. With Piquet the message on the radio was simple. As he passed the pits he said into his helmet microphone "I'm in the s***." By half distance he had got things under control, but was only just able to keep ahead of the McLarens. His stop for tyres was not a quick one, compared to those of Prost, Rosberg and Alboreto and it looked as though he was going to settle for third place, not due to driving ability or car performance, but purely from fuel consumption. However, at 50 laps, with 10 to go, his pit gave him the green light and he wound the Honda up to its full potential, instantly setting new lap records. The McLarens could not respond as they were running to fuel consumption figure orders, and were right on the limit. Just before Piquet caught Rosberg the number two McLaren ran dry and stopped, letting the Williams-Honda into second place. 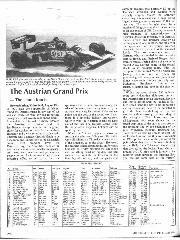 As Prost came in sight of the finish his Porsche engine stuttered and nearly stopped, but by swerving the car about the Frenchman made his pumps pick up the last dregs, the engine cleared and came on song again and he crossed the finish line at low speed as the engine died again. A few seconds later Piquet blasted across the line in second place, with enough fuel left in the tank to complete a "slowing down" lap and to drive into the scrutineering park, and give a final healthy "blip" on the throttle before switching off. The winning car had to be pushed into the scrutineenng park. Not my idea of Grand Prix racing. If we are going to have "economy runs" we might as well let all the cars circulate until the last one is left running and declare it the winner. It might take until after the rains had come, but it would be as significant as the present state of affairs. After it was all over a funny thing happened. 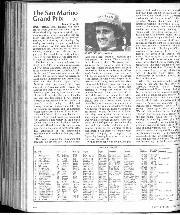 Due to today's instant-media-communications by television, radio, telex, telephone, telefax, recorders and so on, 150 media men demanded words from Piquet before he had got his breath back or discussed the race with his engineers. As he had not run out of fuel in the final sprint he imagined that the pit calculations had erred on the safe side, after seemingly having done their sums wrong in the opening laps, so not wishing to say anything wrong he told the media that it had been a good race, his only trouble being that he had been forced to drive without using the clutch from lap 15, which was why he had slowed up slightly. This story got a bit complicated when someone asked how he had managed to get away after his pit stop if the clutch was not freeing. 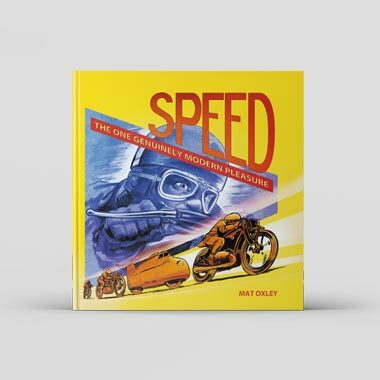 The story quickly changed to the clutch had shown signs of slipping not going solid, but then the question arose, how did he make a new lap record with a slipping clutch? He began to wish he had not tried to be helpful! Times don't change really. When the crankshaft and rods were a mangled mess inside the engine it used to be "plug trouble"; there was a classic occasion when a driver said, hand on heart, "I retired with turbo charger trouble" and his mechanic added "Yes, because a connecting rod came out through the side of the block and smashed the turbocharger off its manifold." You can only find these sort of things out after the dust has settled, or the rains have come. The winner, Alain Prost, didn't really need to say very much. 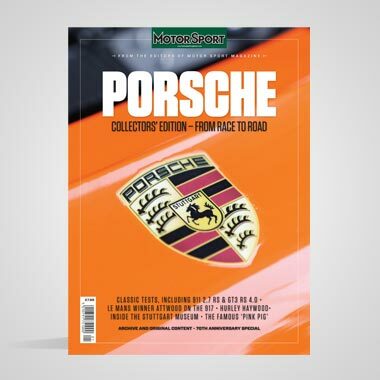 McLaren management, Porsche expertise, Marlboro and TAG money and the delicate, velvet touch of the reigning World Champion had got everything just right. A close-run thing, but you don't have to win by very much, just enough will do, and this time the empty McLaren was not under the regulation weight, so all was well. What of the losers, and there were a lot of them, some from the very start of the event, others along the way. From a dominant pole. position in practice Ayrton Senna, Lotus was gone from the race by 12 laps with a failed wheel-bearing in the right rear hub, and the number two Lotus went out for the same reason. If the Lotus engineers had really known why it wouldn't have happened, would it? They were new bearings fitted the night before the race. In the lower echelons of the starting grid there are many unfortunates, not always their own fault, but you do wonder if they are ever going to make any progress. 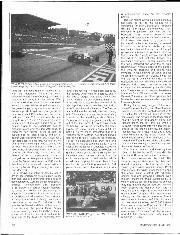 In Spain Jonathan Palmer's Zak speed was rudely punted out of the race by Alan Jones and at Imola the Zakspeed's engine refused to start on the dummy grid and marshals just managed to run and drag the car out of the way before the other 25 cars arrived back for the start. Eventually Palmer joined in from the side of the track after the others had gone. Alessandro Nannini, the new boy in the Minardi team fared little better, for in Spain his Motori-Moderni V6 expired on the parade lap and he went straight into retirement in the pit lane before the green light came on, and at Imola he was elbowed off into the guard rails on the first corner. 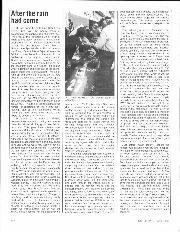 The Tyrrell team took their brand new Type 015 to Spain for its first race, only to have Martin Brundle crash it beyond immediate repair during practice and then they tried again at Imola and he crashed it on his way round to the dummy grid, being forced to start the race with the spare car, which was an old 014 model. 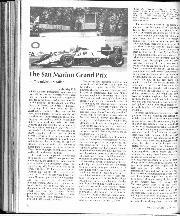 Of no great importance to the outcome of the San Marino Grand Prix, but of especial interest to the future of Formula One was the first appearance of the new Ford engine from the combined brains of Keith Duckworth, and his Cosworth Engineering of Northampton, and the electronics division of the Ford Motor Company of Detroit. This 120-degree V6 engine with twin Garrat turbochargers set a new standard in overall design compared to the existing engines from BMW, Honda, Ferrari, Porsche and Renault just as the Ford-sponsored Cosworth DFV did to Ferrari, Maserati, Repco and BRM in 1967 when it first appeared. Whether this new engine will be as successful as the old one, only time will tell, but if the TAG-sponsored Porsche V6 is considered to be a "third-generation" turbo engine, then the new Ford V6 must surely be the first of a "fourth-generation" of turbo engines. From its small overall size and remarkably short length it must be of small bore and long stroke configuration (though no figures have been released yet), in the interests of torque rather than horsepower, thus making it a much more "drivable" power unit than the BMW engine for example. Rather than follow the popular practice of driving the four camshafts by intemally-toothed belts, Duckworth has used tiny chains which take up the minimum of space and aid the short length and small bulk of the engine. At the moment this engine is exclusively for the Carl Haas team, his cars designed by Neil Oatley and John Baldwin, built by his own workforce gathered from all parts of Formula One in a new factory to the west of London. As Haas is the North American agent for Eric Broadley's Lola cars, the red and blue cars are called Lolas for want of a better name and they felt the temperature of the Formula One water at the end of last year and the beginning of this, powered by Brian Hart's all-alloy 4-cylinder engines. There were two THL 2 Ford-powered cars at Imola for Alan Jones to use, while Patrick Tarnbay gave the THL 1 Hart-powered car its last run. The new Ford engine ran impressively reliably, if not fantastically fast, on its debut, and both cars put in a good mileage during practice. In the race Jones had made his way up from eighteenth on the first lap to ninth on lap 14 but then a mounting for part of the gear-change mechanism came adrift and he stopped for attention. When the bodywork was removed coolant was seen to be leaking from the right-hand radiator, nothing to do with the deranged linkage as some observers thought, the operating rod being a "county mile" away from the radiator With time on their side, thirty minutes was spent installing a new radiator as well as repairing the gear-change linkage and Jones rejoined the race purely to get race mileage on the new power plant. Before his stop his best lap had been 1 min 33.9 sec and after his stop he got down to I min 32.6 sec but then the temperature of the right-hand side of the engine began to rise dramatically and he stopped before any damage was done. In fitting the new radiator in the pit lane the system had not bled properly and an air pocket was restricting the flow. It was not a fairy-tale debut like the 1967 Cosworth DFV, and no-one in their right mind expected it to be, but it was very interesting and a lot of eyes in the pit lane were turned towards car number 15. Personally I could not help thinking of the first appearance of a turbocharged Honda V6 engine in a Spirit chassis driven by Stefan Johansson, in 1983 and to then look at the Honda V6 powered Williams driven by Nelson Piquet leading this year's San Marino Gp. It is always interesting to actually see a driver react intelligently to a situation, rather than hear about it afterwards and a case in point concerned Gerhard Berger in his BMW-engined, Tolernan-team built, Benetton B186. Berger is a sort of Austrian Rosberg, he drives with excitement and flurry at all times; usually looks as if he is about to have an accident, but seldom does. The media call it "fantastic car control" though my idea of car-control is the way Prost drives, or the way Jackie Stewart and Jimmy Clark used to drive. Anyway, the young, lanky, Berger presses on and gets results and he had been going well at Imola, moving up well into the front half of the field and benefiting from other cars retiring. He had been lapped by the leaders, which was no disgrace, and in the closing stages was going faster and faster, making his own personal fastest lap on lap 58. As he approached the end of his 59th lap Prost was approaching the end of his 60th and the end of the race. The Frenchman's McLaren had virtually stopped coming out of the last corners, and was now trickling towards the chequered flag at about 50 mph. Berger, on full song, was gaining rapidly and out of the final corner he could have easily flashed by Prost to put himself on the same lap as the leader, albeit virtually a full lap behind. As the scene presented itself in a flash the young Austrian lifted off and slowed right down, to follow Prost over the finish line. 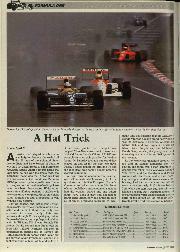 He got the chequered flag after Prost and thus did not have to complete lap 60. 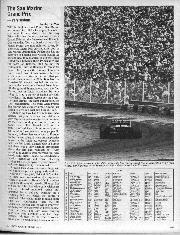 Had he flashed by the leader at unabated speed he would have had to complete lap 60 before he got the chequered flag, and knowing the fuel limitations everyone was suffering from, he could have run out on that last lap, which would have dropped him one place in the results. His quick thinking ensured him 3rd place, one lap behind the winner, and it was a well-deserved place on the winners podium. The San Marino GP was a strange affair, a non-event as far as the Italians were concerned, for even Johansson's 4th place did little to bring joy to the crowds. Their moments of jubilation were few and far between. During practice those in the grandstand opposite the pits had some fun, for Rosberg was about to go out in his McLaren-Porsche when the engine refused to start on the external starter, so the mechanics wheeled the car out of the pit garage and attempted to push-start it along the pit lane. 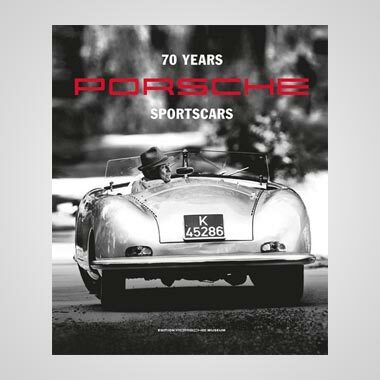 Still it would not start and at that the whistles and cat-calls began; the mechanics tried again without success and the noise increased and when the car was ignominiously wheeled back to the garage the whistling, cheering and booing was immense. It was nothing personal against Rosberg, or McLaren or Porsche, it was just that the red & white car belonged to the opposition that was trouncing their beloved Ferraris and to see it in trouble was to consider it to be defeated by the Maranello cars. The reaction would probably have been the same for a Williams-Honda or a Lotus-Renault. For every one of the opposition that falls by the wayside means another hope that Ferrari might win. During the opening stages of the race when Piquet was leading and Mansell was in trouble in the pits, the British driver set off to do another lap just before Piquet and the rest came along. The crowds on the lower slopes near the end of the lap probably did not see Mansell leave the pit lane, so when a Williams-Honda came into view pouring out smoke, as the engine blew up, the instant reaction was that it was Piquet and a huge cheer went up as the crowd thought the leader had blown up. When Mansell's smoke cleared and Piquet hove in sight, still leading healthily, the cheering stopped instantly, and there was obvious confusion. The final excitement and cheering took place on the last lap as Prost rounded the corners at Rivazza before the final dash to the pit area swerves and the finish. The Porsche engine died and the McLaren almost stopped and the loud-speaker man watching a television monitor thought Prost had stopped. He wildly announced this and the whole circuit erupted with whistles, cheers, boos and screams of delight, even though it meant that Piquet would sail by to victory, and earlier they had cheered at what they had thought was his demise! The wily Prost swerved the McLaren from side to side, the pumps gulped in some fuel and the engine picked up again. There was a stony silence, and the dreaded enemy of Ferrari won the race. It was an awful day, but even so there were something like 80.000 Italians there, just in case the Pope and “Zio" Enzo could work a miracle. The Italians love their motor racing with "passion", which is far more powerful than "enthusiasm". Long may it remain so. — D.S.J.